Mels Box of Chocolates: It's never to late for the Recap Carnival...Right??!! It's never to late for the Recap Carnival...Right??!! I'm a little late linking up to Jo-Lynne's Blog Recap Carnival, but better late than never, right?? To participate you have to take "time to look back over the year and share the first line of the first post each month." I dug into the bottom of my box of chocolates and hunted down the first post of each month in 2010. You can click on each month to find the whole post along with the others I wrote that month. Our Christmas break got off to a zip-a-dee-doo-dah start when we got to see Disney on Ice Let's Celebrate Show in Philly. I shared a montage of pix that I took during our night out. We love attending live shows and we were lucky enough to go to a few last year. So excuse me while I build a snow family and a snow fort! This was the first post of many documenting our adventures in surviving the snowpocalypse that hit Delaware last winter. We got hit with one storm and then another and I loved every minute of it!!! So this weekend I'm attending my first blogging conference. I was actually calling for help to create my first every blog card. The conference was Bloggy Bootcamp and I had a blast. It was an awesome one day, first time blog conference. I learned a lot and was able to network in a safe environment too. If you follow me on Twitter or Facebook then you probably heard that last week was when my school voted on teacher of the year or our TOY as we like to call them. In that post I talked about how I lost out on the Teacher of the Year at my school, but how I thought I handled it pretty well. It's funny because that is also the post that somebody printed and turned into my administration so I got a call into the principal's office for it too. It all ended well, but it sure was interesting meeting with my boss who had a sheets printed out from my blog. Evidently somebody didn't like what I had to say! Wow! What an insanely busy month March was. I can't believe we are already 4 months into 2010. Absolutely unbelievable how fast time goes these days. It's May 1st, and going to be 87 degrees. I love gerber daisies, think I'll get some today. 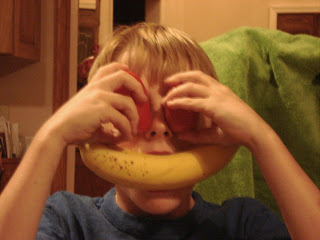 This month started with a picture...Fruit Face! So I'm a little behind on sharing pictures from this month on the blog. I think this line probably sums up my entire year of blogging last year. But, I did go on to share lots of pictures like the ones in the post of Zoe and her dance recital. I've spent the past three hours watching that rose show that is like a thorn in my side, but yet I still go back to smell it. I honestly was not a Bachelor/Bachelorette fan, but last year I somehow got hooked on it at least for the season. This post isn't a recap though, but rather a post to my readers asking for their help. I was struggling finding time to blog and was curious how you found time to blog and live life too! This week was my first full week back at school although technically I guess it wasn't a full week because I did have today off for a four day weekend and I did go back last week so it wasn't my first week back, but anywho...I'm back to work! How's that for a run-on sentence? Guess this teacher wasn't totally back into the swing of school! I've talked a few times about Box Tops for Education and my love of them. This is actually a product review post and I'm ashamed to say that most of October's were as I struggled to find time to blog and keep my head above the water at school. During my blogging hiatus we celebrated Zoe's 6th birthday.This post included a montage of pictures from the birthday celebration and most of the others posts that month were me trying to catch up with sharing our end of summer adventures. At least I made an attempt to try to make it look like I was a real blogger still!! Do you have an Elf on your Shelf ? The Christmas season had begun with the appearance of our elf, who this year, brought gifts to the good kids in the house. The kids loved finding the little trinkets he brought from the North Pole as he came to keep an eye on them! WOW! If the first post of each month is any indicator it seems that 2010 was quite a "blah" year of blogging. I enjoyed going through my archives to dig these posts up and I did find a few great posts and some beautiful memories documenting fun times, but judging by my monthly posts number I was pretty sporadic at best. Here's to making 2011 a better blogging year. Or at least the first posts of each month more exciting!! Did you do a blog recap? Leave me a link so I can come read! !